Cool weather means it’s time for hot coffee! Place a $20 order of any Seaquist products, and we will send you a free Pillow Pack of Door County Harvest Blend Coffee. Cool weather means it’s time for hot coffee! Place a $20 order of any Seaquist products, and we will send you a free Pillow Pack of Door County Harvest Blend Coffee. A taste of toasted praline, – warm, sweet and nutty will soon be one of your favorite coffee flavors, if it isn’t already! Enter promo code COFFEE at the checkout. Your coffee is waiting! Please hurry – this offer ends in a week! Can’t wait! This nice gentleman couldn’t wait to have his slice of pie! He hadn’t paid yet, or even gotten close to the checkout! 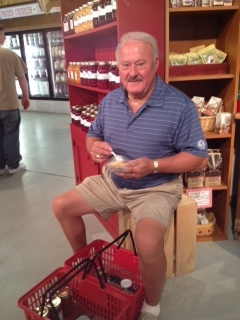 He found a crate near our pie slice display, grabbed a spork – and started eating! Yum – delicious! Have you been in Door County, to Seaquist Orchards Farm Market lately? Stop in and sample our famous salad dressings! Have you been in Door County, to Seaquist Orchards Farm Market lately? Stop in and sample our famous salad dressings! Print this page and bring it in for 20% off any Seaquist salad dressing. Or type in promo code 20dres and receive a 20% discount online.